At Rookwood Cemetery in Sydney's west, Islamic Burial Section 8 is by the telegraph tower and the train line. As I pull over, I notice other people conversing quietly with God by the graves of their loved ones. It looks like a funeral has recently taken place. I remind myself, inna lillah wa inna illayhi raji'un: we belong to God and it is to Him we return. 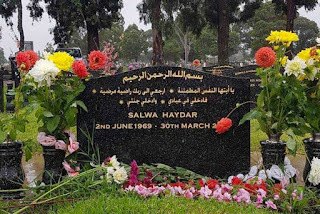 I'm here to visit the grave of my mum, Salwa Haydar, who was just 45 years old when she was murdered by my father in 2015. She was preparing her dinner in the kitchen after a long day's work when he attacked her with a knife. My sister, who was 18 at the time, fought him with her bare hands and was injured in the attack. My father's actions were cowardly, merciless and unrelenting: my mum died at the scene from about 30 stab wounds. Arriving at my mother's resting place, I empty the vases that flank her tombstone and fill them with fresh water and blooms — daisies and dahlias — before turning to her neighbours. In an adjacent row, 16-year-old Mahmoud Hrouk is buried. I take my spare flowers to him. Mahmoud was sexually assaulted and murdered in 2015 by Aymen Turkmani who left his body in an abandoned house in Villawood. Turkmani was subsequently found guilty and sentenced to a maximum of 45 years in prison. Mahmoud's youthful face is never far from my thoughts — his funeral happened soon after my mum's and the sadness of their two stories seems to have fused in my mind. I notice that the lilies by his tombstone are still in the bud. I think of his mum. I then wander towards the back of Section 8, where, right by the fence line, lays baby Omaira: "Born without breath, but not without love". Omaira died at 5 months' gestation when her pregnant mother was attacked by her abusive male partner. Omaira's tiny, humble grave has been decorated with pebbles and rainbow windmills. I remind myself to bring more flowers next time. Children without parents, parents without children. Who else is here because of male violence? I ponder the question as I drive away with a heavy heart. Why don't we talk more openly about the effects of male violence on our families? For Muslim women in particular, the answers are complex. Recently, however, I've noticed a growing number of us are standing up to the forces that keep us quiet and I'm energised by the community's willingness to listen.